BATON ROUGE, La. 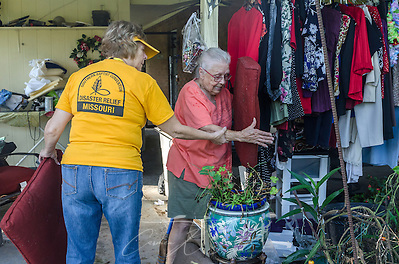 – Southern Baptist Disaster Relief (SBDR) volunteers continue flood recovery efforts across south Louisiana, coping with intermittent rain as they tear out insulation, sweep mud from houses and carry buckets of sodden clothing to curbs. Few areas were left unscathed last week when nearly 7 trillion gallons of rain fell, killing 13 people and damaging more than 60,000 homes in 20 parishes. State officials estimate the damages will exceed $20 billion, making the 500-year flood event one of the worst disasters to strike the United States since Hurricane Sandy in 2012. The damage begins in Hammond, Louisiana, and extends 160 miles west toward the Texas border. Along Interstate 12, once lush foliage is withered and gray. Trash flanks fences. Advertisements for home guttings become more numerous with every mile. Neighborhoods and side streets tell a heartbreaking story. Clothes, mattresses and household furniture lay strewn across wet lawns in hopes that the sun will shine long enough to dry them. Everything that was not salvageable is piled high along the roadways, transforming shady lanes to narrow pathways, children’s toys providing the occasional jolt of color. Even some of the most seasoned volunteers were surprised by both the scope and intensity of the damage. A few weeks ago, Southern Baptist Disaster Relief (SBDR) chaplain Roy Christy, a member of Northern Hills Baptist Church in Holt, Missouri, was tearing out walls in flood-damaged Texas. This week, he is assessing homes and offering emotional support to flood survivors in Baton Rouge, where more than 19 inches of rain fell in 15 hours. In Watson, Louisiana, northeast of Baton Rouge, more than 31 inches of rain fell. “The damage is impressive, very extensive,” Christy said. “But the people here help each other out a lot. They’re very focused on the community, not just themselves.” Christy and his team are working out of Zoar Baptist Church while assisting local homeowners. Flood survivor Fay McDowell, 82, has been a member of Zoar since 1962. Her home, located on a busy inland highway, has never flooded, but when the water began rising, she knew she had to leave. She had just enough time to pack a few clothes and place her terrified cat, Mimi, in her attic. Then she grabbed her suitcase and her dog, Honey, and opened the door. Water poured into her kitchen, and it was continuing to rise. So she fled to the only place she knew she would be safe—her beloved church. When she was finally able to return home, the sight brought her to her knees. Everything in the house below waist-level was ruined. “Oh, God, how do people make it that don’t have God’s help,” she said Monday morning, crying as she recalled how bleak things looked. Her husband died three years ago, and she wasn’t sure how she would get the help she needed to begin piecing her home—and her life—back together. Hope arrived wearing gold shirts and carrying shovels. Their work is a race against time. They have already removed most of the sheetrock, baseboards and flooring, but mold is beginning to appear, and they are scrambling to get the house gutted and sprayed with Shockwave, a disinfectant designed to kill and prevent mold. McDowell is currently living in her 12-by-18-foot sunroom with her dog and cat but hopes she will soon be back in her three-bedroom house. She is appreciative for the little things. 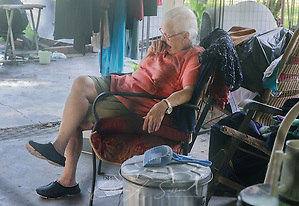 While one group of volunteers set up a dog kennel in her back yard, filling it with cushions and a bucket of fresh water, others struggled to get her air conditioner running. But the blessings go both ways, said volunteer Sheila Gatlin. 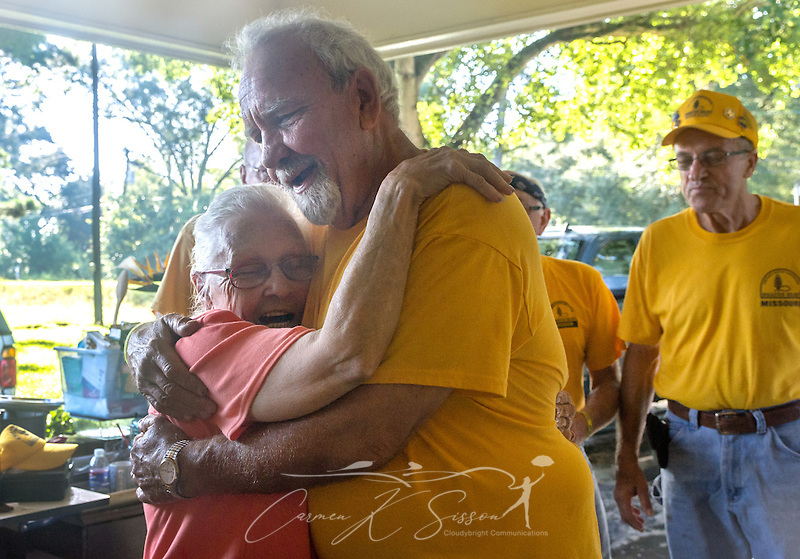 She and her husband, Roger Gatlin, attend Pisgah Baptist Church in Excelsior Springs, Missouri, and they began volunteering with SBDR several years ago. Emotions after the flood run from one extreme to the other, Christy said. Some, like McDowell, draw comfort from their faith. Others are struggling. Christy carries orange pens bearing the words, “Jesus loves you.” When he said those words to a flood survivor during Sunday services at Zoar, she wrapped her arms around his neck and began crying. Minutes passed as he held her, absorbing her pain as she sobbed. She never spoke. Disaster relief efforts are ongoing as assessors traverse the state, looking for people in need. So far, more than 96,000 individuals and households have registered for assistance with the Federal Emergency Management Agency. As for McDowell, she said she knows now that she will be okay. She renewed her flood insurance, just in time. And SBDR is on the scene to provide not only labor but also the emotional and spiritual support she needed. Those wishing to donate to SBDR relief can contact the Baptist convention in their state or visit donations.namb.net/dr-donations. Carmen K. Sisson is an award-winning independent journalist and photojournalist, with three decades of experience covering the Deep South. Published credits include TIME, Christian Science Monitor, New York Times, Washington Post, Associated Press and others. Baptist, faith-based charities, flood, Louisiana, religion, Southern Baptist Disaster Relief, weather. Bookmark.